Curious Inkling T-Shirts, tee shirts and tops > Funny/Pop-Culture/Entertainment > D.A.D.D. Fathers know what evil lurks in the minds of boys who pursue our daughters for undetermined youthful activities. Many dads feel alone in the war to protect our little princesses from the insipid distractions of...BOYS! Join D.A.D.D. (Dads Against Daughters Dating) and let your voice be heard. We are a massive group of caring fathers who are determined to thwart the disgusting advances of young men who hunger for the attentions of our beautiful daughters. If you join D.A.D.D. today, you get a beautiful shirt of your choice (shown below) and the confidence of knowing that when you answer your door wearing the shirt, pimply faced boys who know nothing about honor or respect will flee from your doorstep! 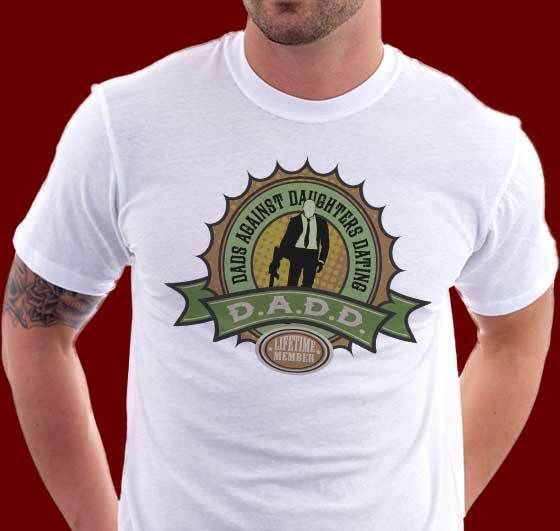 Our Dads Against Daughters Dating shirts are emblazoned with the D.A.D.D. logo featuring beautiful greens and browns and of course a very dangerous looking man wielding a high-powered automatic weapon. Yep, that should do the job just right!